It was the kind of rain that only exists in the surreal books of Gabriel Garcia Marquez. It started on the Friday afternoon that we left El Bolson and did not stop until this morning, just over seven days later. It was steady rain which furtively soaked, rather than a heavy downpour, and it swept the memory of the last three months of sun and blue sky from our minds. And so, under dark skies and a wind whipping Lake Nahuel Huapi into a frenzy, we arrived in the ski capital of Argentina, Bariloche. Our hostel, on the top floor of the highest building in town, had a simply stunning view of the lake and the surrounding mountains and we spent a couple of days reading and eating and recovering after the El Bolson trek, which seemed to take more out of us then we had realised. 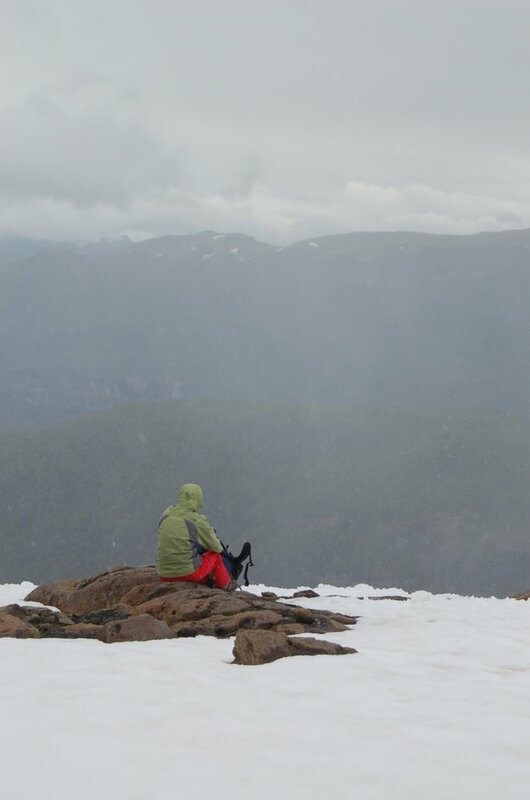 The mountain trek that we wanted to do through Nahuel Huapi national park was buried under a few feet of snow and we decided to take a battered bus with other goretex-clad walkers to Pampa Linda, a campsite and park office, two hours south west of Bariloche. Heads craned as we looked up at mountains buried under fresh snow on the journey - not the sunny, snow-free conditions that this time of the year should bring. We began to wonder exactly what we could achieve. The bus driver dumped us unceremoniously in the rain and we put up the tent and climbed into our sleeping bags with our books. It was two in the afternoon. Lying in the tent, we could hear longs rumbles every half hour or so. 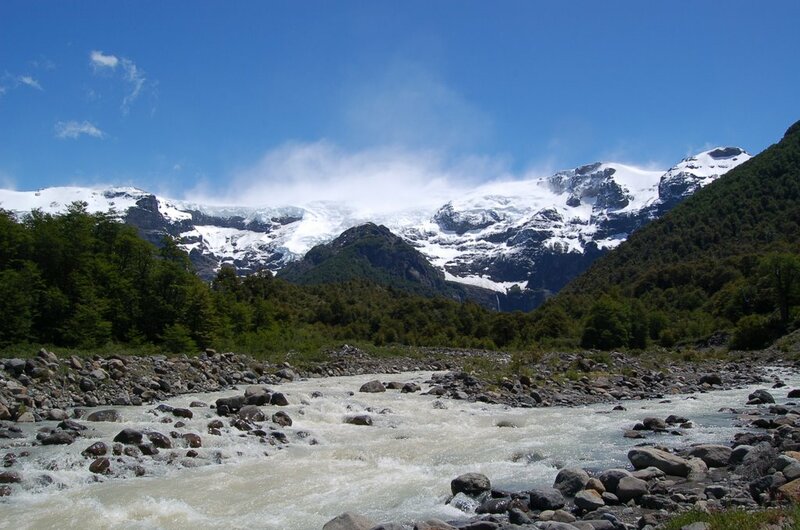 Eight kilometres to our north was Mount Tronador, Mapuche for the Mountain of Thunder, and the regular falls of ice from the glaciers sent huge booms down the valley. It was all pretty primeval in the driving rain. 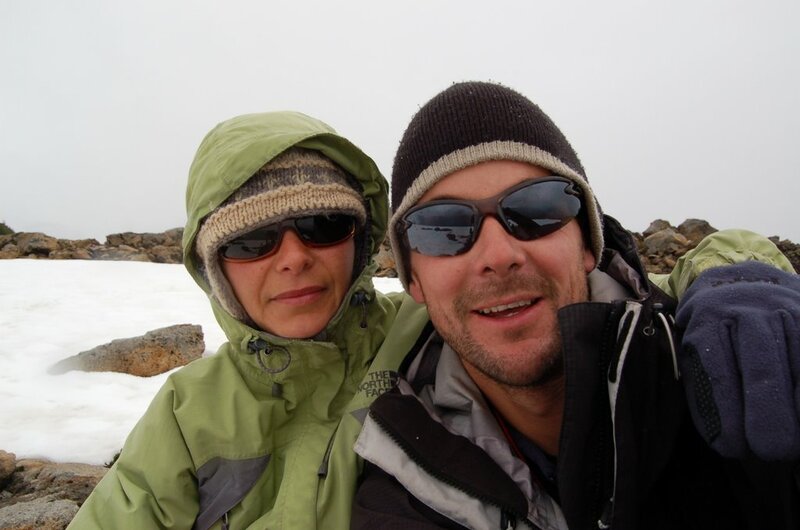 The next morning, we set off for a refuge five hours´ climb through wet woodland and eventually slushy snow. From the start of the snowline to the refuge lay almost 2 kilometres of deep snow, the route clinging to a narrow ridge. We climbed the first snow slope and found ourselves battered by a howling wind trying to blow us off the cliff to our left. We could see the blue of the glacier through the near white out conditions and a fall would have been fatal several times over. We had no snow equipment, the weather was worsening and there was an hour or so of walking ahead of us. So we turned back, deciding that discretion was the better part of valour. The walk down in the rain compounded our sense of failure, despite the fact that we knew we had made the right decision. The next morning, the wind was near gale force on the high peaks and we watched avalanches swept off cliffs as the wind drove waves of new snow up the sides of the mountains. We were glad that we were in the shelter of the valley. The bus left in the late afternoon and we returned in rain to Bariloche where, gluttons for punishment, we camped a few kilometres out of town. But we are not strong (or proud) and rented an apartment yesterday for a few days over Christmas. We have bought each other presents, but a hot shower, fridge and bed with clean sheets were the best Christmas presents that we could have wished for. Hey couple!!!! !, I won´t ask you how you are... pictures show it. Nice pictures and good comments, amazing. Un saludo chavalotes, espero leer más sobre vosotros.